This entry was posted in Firefox, Microsoft, Mozilla, planet by flod. Bookmark the permalink. It looks like the people at microsoft have it the wrong way around for most of the chart. Poor old fools. They’ve lost their minds. But I think that some form of official complaint is needed from Mozilla and Google at this as MS are flat out lying to their customers by this chart. To play Devil’s Advocate, I would point out that Firefox 3.5 isn’t out yet, so one can’t rightly compare Private Browsing Mode to IE8’s InPrivate. OTOH, it’s completely unfair to ignore Chrome’s Incognito. Regarding Security+Privacy, it’s funny how they fail to point out that they’re more likely violating your privacy in the interest of security by sending every URL you visit to Microsoft. That is why I turn their phishing filter /off/ at the expense of security. They are *absolutely* correct, and I really wish Mozilla would put more effort behind this. This has kept me from implementing Firefox for a not insignificant audience. (I’d be long dead if I held my breath since it was stated that 1.5 would be released with an MSI.) Mozilla is missing a huge market by focusing strictly on home users. Quite ironic how this is on their “Get the facts” site. Microsoft SharePoint’s explorer view is b0rked in IE8 yet works flawlessly in both IE7 and IE6. Hahaha, that table is hilarious! IE8 gets a tick for “Ease of use”. 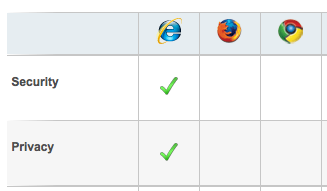 They’re forgetting that IE8 has *two* tools menus which contain different stuff. And *two* favorites menus, also with different things. Big lol … I guess that’s why they needed to invent Compatibility mode/view? Again, LMAO. How is IE8 tied to either Chrome or Firefox when it comes to web standards? I don’t know MSIE at all and I haven’t tested Google Chrome yet, but I can confirm that Mozilla Firefox has some very serious problems regarding privacy (even with “Private Browsing” mode enabled)… See demo. I second John Silvestri about the fact that Mozilla doesn’t provides .MSI for its products so it’s harder to deploy for Win Sysadmins.